There are a few things to bear in mind when using them. 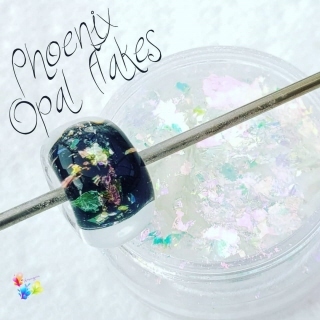 You need to get a good coverage, securely adhere them to your bead, you need to keep them out of a direct flame and prolonged heat.🔥 So how do you do that? I used the back of a teaspoon handle to scoop a few flakes onto a marver (best to start with just a few) and gently spread them out. I made my base, and got it to a warm red glow and quickly rolled it over the flakes. Then to ensure they stayed put, I burnished them using the surface and edge if my marver. Then I wanted to encase them as cool as possible. I opted to use the swipe / toothpaste method. Keeping the bead close but out of the flame, I heated a gather of clear, let it cool for 1 second and made a swipe over the bead, pressing down as I did it to make it adhere & spread out, repeat till covered. Then higher in the flame melted in the edges to make sure it sealed the flakes. From here, you can melt in, but I would recommend not letting the bead get as warm as you would with normal encasing. As it gets warmer, remove from the flame to stop the heat penetrating to the core, you only want to melt in the top layer. Also, use marver to help smooth as you melt. 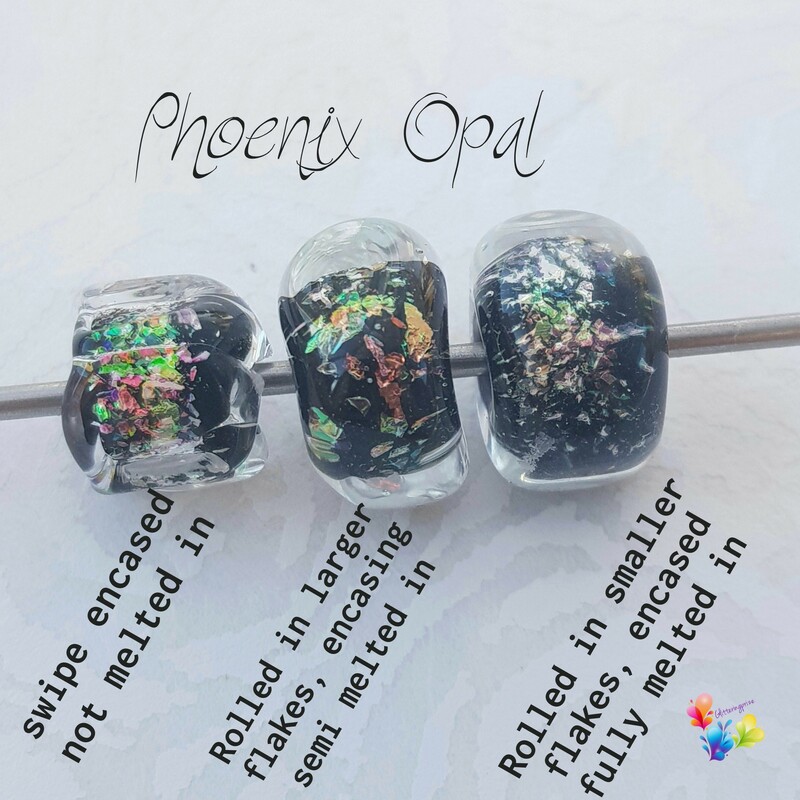 Results can vary depending on the size of flakes you get on your bead and how much heat you give them, so do bear that in mind as you first try them out. Oh, and have patience! 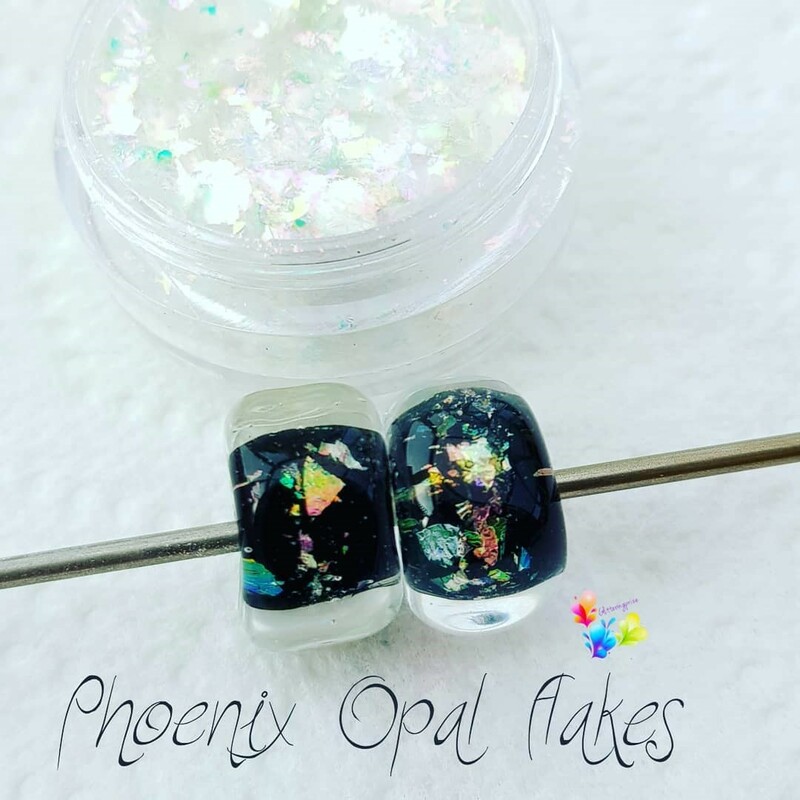 I was really pleased with the results with this blend, over black the flakes radiate a gentle rainbow lustre with warm coral pink overtones! I hope that these notes help you to get the best out of your flakes ... enjoy!